What is Reverse Osmosis & How does it work? 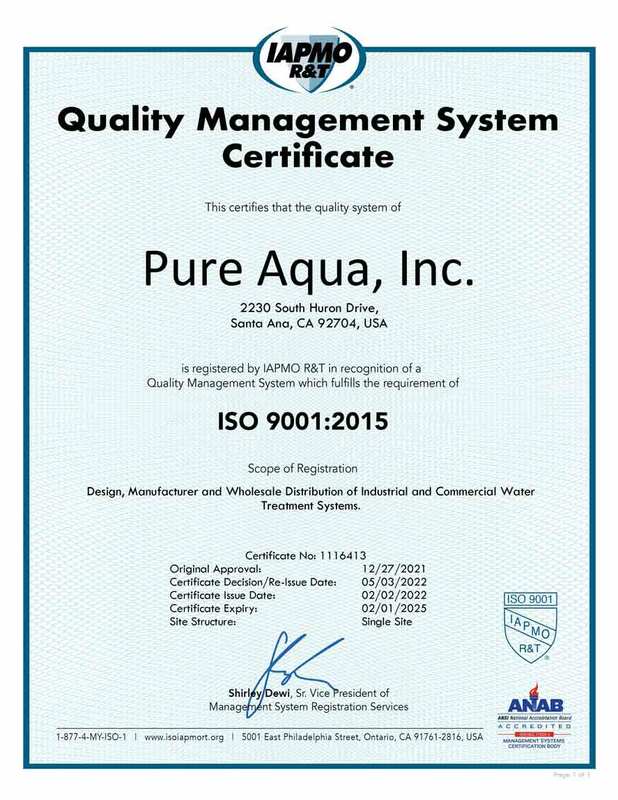 - Pure Aqua, Inc. Reverse osmosis is a hot topic in the water treatment industry. With the lowest energy requirements, some of the highest recovery rates, and one of the best rejection rates on the market, it's no wonder people are interested in learning more about it. What is the definition of reverse osmosis, though? How does it work? Let's take a look into the heart of a Pure Aqua RO System and break it down for you to understand. As anyone could guess, it is the process of osmosis backwards. Osmosis is the passage of water through a protein membrane (like our skin, or the inside of a plant cell) to equalize the concentration of particles dissolved in the water. The protein membrane allows water to pass through, but molecules larger than water (things like minerals, salts, and bacteria) cannot. Water flows back and forth until the concentration is equal on both sides of the membrane, and an equilibrium is formed. Now that we've answered the biggest question about Membranes Systems by Pure Aqua, let's take a closer look at how we build our advanced water treatment systems and how they work. Reverse Osmosis is an ideal water treatment solution in most types of water. Generally speaking, all major water sources from a treatment standpoint can be broken down into three major categories: tap water, also known as municipal sources, groundwater, which includes brackish water, and saltwater. The biggest distinction between these three types is the Total Dissolved Solids (TDS) content of each type. As a rule of thumb, the American Health Association requires that drinking water is under 1,000 PPM TDS. Tap water typically comes through a pre-existing infrastructure like city pipes or a damming system. Reverse osmosis is often used in a tap water environment to reduce hardness, or the debris deposited in water from traveling in metal pipes. Total dissolved solids is often a target of water purification in tap water systems. This type of Reverse Osmosis Systems are ideal in places like power plants, pharmaceuticals, laboratories, and hospitals, where an extreme purity of water is crucial to the industry. Tap water typically has a TDS of under 1,000 PPM. Underground reservoirs of water are often brackish or highly brackish, meaning they contain large volumes of salt, but not enough to be considered salt water. Groundwater reverse osmosis is very common, and one of the best uses of a Reverse Osmosis System to date. Groundwater is most often purified for the agriculture industry, the mining industry, and for residential use. Groundwater is also a prized target of the bottling industry, because the unique mineral combinations often have an appealing taste. Brackish water usually has a TDS of 5,000 PPM or less, but can come in concentrations of up to 12,000 PPM. Salt water reverse osmosis (sometimes referred to simply as desalination) is the turning of saltwater into drinking water. Ocean water has up to 45,000 PPM TDS. Typically, for environmental reasons, a bore hole is dug in the ocean for this kind of reverse osmosis, but an open intake is more cost effective. The biggest uses of desalination come in providing water in areas that lack a regular supply of fresh water. Autopsies of failed membranes modules have revealed a build-up of foulants caused by mineral scales such as calcium carbonate; colloidal materials like clays and silica; dead and living microorganism; carbon particles; and chemical attach by oxidizing agents like chlorine, ozone, or permanganate. Likewise, dissolved metals like iron and aluminum, whether naturally occurring or added as a coagulant, can cause premature fouling and failure of the membrane. In one word: analysis. Every source of water is different, and you never know what's in your water until you have it analyzed. The water analysis, LSI, SDI, or CFI values are used to determine the precise pretreatment requirements for a particular RO System. Since water supplies vary considerably from one location to another, each pretreatment requirement will be different. On average, most Reverse Osmosis Systems need an antiscalant injector or water softener to prevent damage to the membrane. Ion exchange is a popular method for reducing the potential for mineral scale formation on the membrane surface. Ion exchange softening uses sodium to replace scale-forming ions such as calcium, magnesium, barium, strontium, iron, and aluminum to prevent damage to the membrane elements.. The sodium forms very soluble salts, which are readily rejected by the Reverse Osmosis System and do not readily form mineral scales on the membrane surface. A sodium-cycle softener is regenerated with sodium chloride brine. The spent regenerant, along with the softener rinse water, must be discharged to waste. It is because of this that ion exchange is recommended for applications that have high metal contents in the treated water. Reverse osmosis is a reliable method for producing high-purity water. However, most water supplies require some form of RO pretreatment such as softening, media filtration, activated carbon, or chemical injection to protect the membranes from premature fouling or failure. The pretreatment requirements will vary from location to location, but the overall objective remains the same: to maintain the design flux rates, minimize the membranes cleaning frequency, and prolong the useful life of the RO equipment.